At a time when many tabletop war games are experiencing component bloat (so. many. miniatures. ), there is something special about a game that looks simple and offers significant depth. AEG’s War Chest reminds of generals pushing pawns around a war table, guiding the effort from on high. The best part is that War Chest is relatively simple to teach, but offers enough depth that skilled players can devise clever strategies. Throw in a diverse set of units and an optional drafting mechanic that allows players to experiment with different combinations, and you’ve got a game that will likely make its way to the table over and over again. 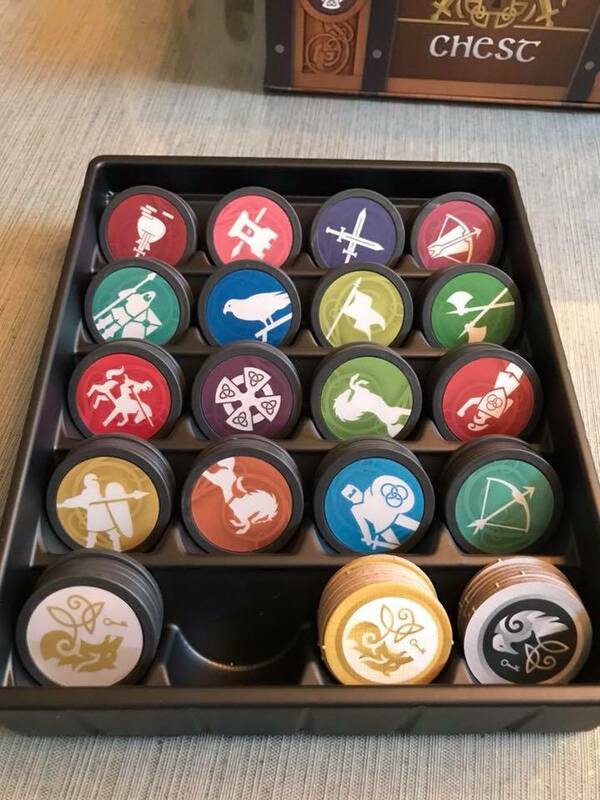 War Chest is a strategy game for two or four players that pits armies of medieval-era units against one another in a race to capture key points on the board. In each round, you’ll draw three poker chips from your bag. Most of these serve multiple functions, making each play an interesting choice. On your turn, you’ll play one of your chips to deploy it as a unit on the board or reinforce or activate a unit of the same type already on the board. You can also use your chips to recruit new units from your pool that will get put into your bag to be drawn later. Each unit type has a unique ability that might affect the way it moves, attacks, or deploys. In many ways, War Chest is similar to Chess, as you’ll be weighing the risks of over-extending your forces versus creating a better-defended position. Unlike Chess, you’ll never know which chips your opponent is holding. This incentivizes risk-taking. For instance, you might move your unit to a capture point in range of an archer. This could lead to a quick death… but only if your foe has another archer chip in hand to activate the one on the board. Keeping track of how many of each unit your opponent has recruited and which are in the discard pile is a key part of developing strategy. However, some actions allow you to place a chip face down when playing, so you won’t always have perfect information. How complex is War Chest? There are a number of similarities between teaching people how to play Chess and War Chest (and, in fact, many tabletop games). You want new players, especially young players, to feel empowered. Certainly, you can lay the board out, set up the pieces, and demolish someone who doesn’t know a bishop from a rook. But that isn’t fun for them. The same goes for War Chest. The manual suggests a pair of armies to start with. Follow the advice. The eight unit types included are fairly easy to understand. For your first game with a new player, use open hands. In other words, when you pull your chips from the bag, lay them out in front of you so your opponent can see. This way, you’ll be able to answer questions and suggest options (if your opponent is receptive to that). Plan to play two games, and switch armies after. Your opponent will know how your units work and they’ll have seen the ones they are now controlling. This time, play without revealing your chip draws to your opponent. After you’ve got a couple of games under your belt, you can switch up how you build armies. Drafting is a great option. Start with the specified number of unit cards found in the manual and take turns picking until you have full armies. You can also just deal out randomly the appropriate number of units (four for a two-player game, three for a four-player game). AEG has done a great job with the manual and guiding players into the game. If you’re playing with someone younger, taking the extra step with your first game will give them a much better understanding and help them feel like they have a good grasp of basic strategies. After that, it’s just a matter of practice and experimentation. Let your younger players make mistakes and learn from them. If they start to get frustrated, you can explain other choices they might have made or let them take back moves for a few games. We’ve seen our kids get better at Chess with this approach, and War Chest benefits from the same philosophy. How many players should I have at the table for War Chest? At first, stick to one-on-one matches. Once you’ve figured everything out, you can easily expand to two-versus-two games with the larger map. Unlike many team games, War Chest requires “table talk.” That is to say that you’re supposed to discuss strategy openly. Nothing should be hidden from the opposing team. Make sure that everyone has a good understanding of the game flow in a two-player match before diving in with four players. It can get overwhelming without the foundational understanding of the game. War Chest reminds me of how I felt when playing one of my favorite childhood games: Stratego. The core mechanics are simple to grasp. there are meaningful choices from the start, and there are plenty of reasons to bring it back to the table time and again. 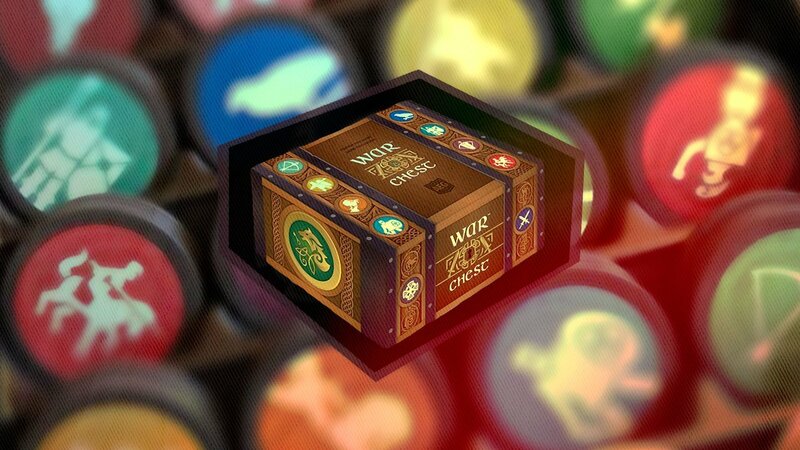 Where War Chest excels is that each turn is meaningful, offering players multiple choices. Combine that with play that’s both easy to learn and inspires deeper strategy, and you’ve got a game that speaks to a diverse audience. It’s abstract enough that people who are turned off by too many fiddly pieces can sink into it with ease. And its battlefield aesthetic is amplified by the inclusion of a few scenarios ripped from history. 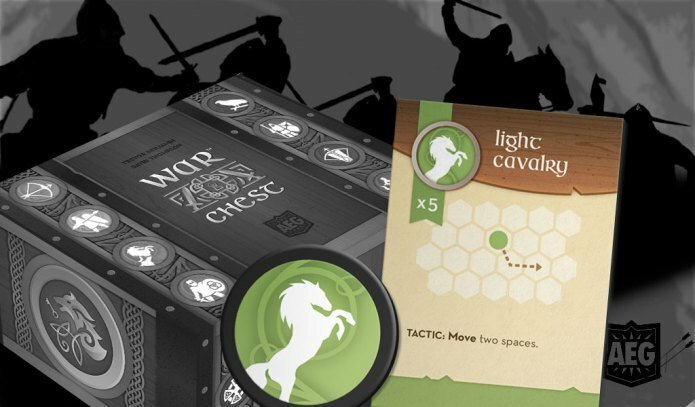 Right out of the box, War Chest is an attractive package with meaty pieces that are also familiar and comfortable enough to woo in those that don’t typically play tabletop games. Especially if you have young ones that have shown interest in Chess, War Chest is an easy game to recommend.